Sunne Wright McPeak is the President and CEO of the California Emerging Technology Fund (CETF), a statewide non-profit organization whose mission is to close the Digital Divide by accelerating the deployment and adoption of broadband. She assumed the position as the CETF first chief executive in December 2006 after serving for three years as Secretary of the California Business, Transportation and Housing Agency. With McPeak’s vision and drive, CETF has positioned California as a national leader in closing the Digital Divide, initiating groundbreaking applications such as the California Telehealth Network, Digital Literacy, Smart Housing Policy, School2Home (to improve education), and Get Connected! (to drive adoption). 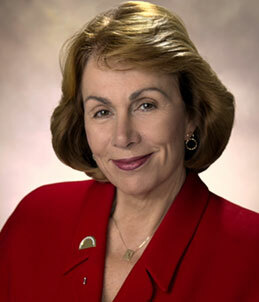 As Secretary of the California Business, Transportation and Housing Agency, McPeak oversaw the largest state Agency, including the Department of Transportation (Caltrans), Department of Motor Vehicles, California Highway Patrol, Office of Traffic Safety, Department of Housing and Community Development, California Housing Finance Agency, Department of Real Estate, Office of Real Estate Appraisers, Department of Financial Institutions, Department of Corporations, Department of Alcohol and Beverage Control, Department of Managed Health Care, Office of Patient Advocate, Infrastructure and Economic Development Bank, California Travel and Tourism Commission, California Film Commission, Small Business Guarantee Program, Office of Military and Aerospace Support, International Trade Promotion Program, and New Motor Vehicle Board. She was responsible for more than 42,000 employees and a budget in excess of $11 billion. Under McPeak’s leadership, performance and productivity in all departments of the Agency improved significantly—cutting average wait times at the DMV from over an hour to 21 minutes, reducing by two-thirds the time to issue real estate licenses, and generating more than $180 million in savings. She also provided key policy leadership in support of the Governor to develop and implement major investments in infrastructure and to foster groundbreaking regional “smart growth” planning. Before being recruited to the Governor’s Cabinet, McPeak served for seven years as President and CEO of the Bay Area Council, a major employer-led policy organization addressing regional economic prosperity issues. For three years prior, she served as the President and CEO of the Bay Area Economic Forum, a public-private partnership between the Bay Area Council and the Association of Bay Area Governments. In that position she pioneered the development and deployment of regional economic performance metrics to drive public policy. Sunne McPeak served for more than fifteen years as a member of the Contra Costa County Board of Supervisors, having been first elected at age 30. When she left public office her colleagues renamed the Board Chambers in her honor. She has led numerous statewide initiatives on a variety of issues ranging from water, to housing, to child care, and served as President of the California State Association of Counties in 1984. She was named by the San Francisco League of Women Voters as “A Woman Who Could Be President.” She also served on the Boards of Directors of First Nationwide Bank and Simpson Manufacturing Company. Sunne (whose first name is her Norwegian grandmother’s family last name) grew up on a small dairy farm in the San Joaquin Valley. She earned a B.A. in an Individual Major (International Medicine) from the University of California, Santa Barbara, and a MPH in Health Education and Medical Care Administration from the University of California, Berkeley. She has been awarded two honorary doctorates from California State University East Bay and John F. Kennedy University. She and John McPeak have been married for 45 years and have two adult sons, a daughter-in-law and four grandchildren.